The Sega Technical Institute was a unique place in the gaming industry that hasn’t been duplicated since. Imagine a community where Japanese and American developers worked together to create games, with complete autonomy from the management upstairs. Many developers today would kill for that kind of environment, and it’s something that has somehow never gotten the press it deserved, considering how much the business has evolved since its inception. Many of Sega’s biggest and brightest minds passed through the hallowed halls of the STI, including Yuji Naka, Mark Cerny, and Stieg Hedlund. One of the most creative personalities there was a designer named Peter Morawiec, who’s most fondly remembered by Genesis fans for creating the much-beloved Comix Zone. His involvement didn’t stop there though, and he also designed Sonic Spinball and made contributions Sonic 2. After leaving Sega, Morawiec went on to co-found Luxoflux, which has produced such hits as Vigilante 8 and True Crime: Streets of LA. Recently, he’s recently started a new game company called Isopod Labs with his long-time business partner (and Comix Zone programmer) Adrian Stephens. Sega-16 recently had the opportunity to speak to Mr. Morawiec about his time at the STI. Sega-16: How did you get your start at Sega? Were you already involved in other games in development, or were you recruited directly into the Sega Technical Institute? Peter Morawiec: I did not have any game development experience but I was fascinated with CG and the interactivity of games and very much wanted to break into the business. I pestered Mark Cerny (Marble Madness) for a year, sending in all kinds of designs and animations. I was finally hired in March of 1992 to join Yutaka Sugano’s (Shinobi) small coin-op R&D team operating from within STI. I was twenty-two years-old and still remember the excitement! Sega-16: What was it like making the switch from coin-ops to the Genesis? Many programmers have said that the console was easy to program for. What were your initial impressions? Peter Morawiec: As a designer/artist, I never had to do actual programming. My PC of choice back than was the Commodore Amiga, which was using the same 16-bit CPU as the Genesis and was graphically pretty advanced, so it was an easy transition for me. The console was pretty friendly to program for but it took top assembly programmers like Mark, Adrian or Naka to max out its performance, pull off advanced visual tricks, and pack the data tightly (cartridge size greatly affected profitability). Sega-16: STI had a lot of autonomy compared to other internal Sega teams. Was this an idea that came from American management? What did the Japanese side of Sega think of it? Peter Morawiec: My understanding was that STI was cooked up by Mark Cerny and Sega executives in Japan. Its purpose was to expose Japanese teams to the western culture and “gaming values.” Mark Cerny moved from Japan and set up shop in Palo Alto under the guise of a “training facility” where the Japanese could work and learn alongside their non-Japanese teammates. Sega-16: It’s been reported that there were cultural clashes between the Japanese and American teams at STI, which came to a head after Sonic 2 was shipped. What exactly happened? Sega-16: Do you think things worked better with the Americans doing their own projects while the Japanese did theirs? Peter Morawiec: I don’t think so, although I’m sure some people welcomed the split. For instance, I sometimes wished that we had more Japanese artists on Spinball because I found the disparity in art styles throughout the game pretty jarring. We had only one artist from Japan (Katsuhiko Sato) who did a couple of great stages — geometrically clean, colorful, and very Sonic-like — but those stages don’t quite match most of the other art in the game. It’s not bad art, but it’s inconsistent and just not as tight. Other STI projects like Comix Zone or The Ooze could’ve also benefited greatly if some of the experienced Japanese developers participated. Sega-16: Mark Cerny left the STI just as Sonic 2 was being finished. How did the change in leadership affect your projects? Did it give you more influence to get them off the ground or did it set you back? Peter Morawiec: I like Mark; he was a big proponent of hiring fresh talent with new ideas and there were many cool concepts in the works at STI when I joined — the place felt like an incubator where people just had fun cooking up game concepts. I transferred out from the coin-op division right after Mark’s departure. Sonic was becoming huge business and Sega wanted a seasoned exec to run the studio. Roger Hector was hired from Disney, and I think STI presented quite a “culture shock” for him, but he understood the unorthodox setup and did his best to work with it. The atmosphere changed dramatically, but it was mostly due to Sega’s growth, not change in STI’s leadership. We were moved to a fancy SoA campus in Redwood Shores, and suddenly we had to put on presentations in front of a whole slew of executives and marketing people, etc. Personally I can’t complain because I managed to get two projects off the ground, but things became pretty corporate all of a sudden. Sega-16: The video you graciously donated is the game we mentioned in our interview with Sonic Xtreme artist Chris Senn, who stated that it later evolved into Xtreme; however, all evidence points to the contrary. Can you tell us more about this unreleased Sonic title? Peter Morawiec: Shortly after finishing Sonic Spinball, Roger Hector (STI’s boss) took Naka’s team and number of us down to DiC Animation in Burbank, CA. The studio was about to start production on a Sonic cartoon series for the ABC TV network. It was a funny meeting – the storyboards were super Warner Bros’y, all squash-and-stretch, and full of silly slapstick humor. The Sonic Team guys sat through the spiel all stone-faced, so I don’t think they liked it very much. Roger was interested in having STI create a spin-off game based on the show, so I tried to come up with a gameplay format allowing for more story and adventure than the original Sonic games. I had made a number of these Amiga demos by then, so it didn’t take very long to put together, probably less than a week. John Duggan (STI’s Art Director) created the title screen and helped with the character sprites. Sega-16: As the climate within Sega management changed, how did this affect STI’s output? Peter Morawiec: STI took more time with their original titles than other SoA games produced externally. I think that was true throughout STI’s history, partially because the Sonic games were considered priority, but also because STI had its own fairly generous budget and received less scrutiny. Sega-16: Sega’s branched out considerably with the Sonic brand since the first game, with mixed results. Looking back on Sonic Spinball, how do you think it holds up today as a Sonic title? Peter Morawiec: Sonic Spinball was intended as a stop-gap product when it became clear that Naka wouldn’t be able to deliver Sonic 3 for Christmas. Marketing proposed that we make a game based on the Casino stages, so I pitched a more traditional pinball gameplay with Sonic. Everybody seemed to like the demo, but we had only nine months to do it — from scratch, on our own, and without any help from the Sonic Team. It created some controversy within STI, but I give Roger a lot of credit for hiring a couple of experienced contractors (Denis Kobel and Lee Actor) to help us deliver the game on time. These guys were knowledgeable programmers and really good to work with; they coded up Spinball in C, which wasn’t the norm back then (most games were still done in Assembly). (Regarding the demo video) This animation was created in a major hurry before CES, in something like 2-3 days. There was a very good pinball game on the Amiga called Pinball Dreams which inspired me to try to design the levels more like actual pinball tables. I tried to show this through the demo, but there wasn’t enough time to make the backgrounds scroll about. Kurt Peterson, a really talented STI artist/animator, drew up the volcano for the title sequence. And, as in all my other pitches, I picked out a cool MOD song from the Amiga scene to help it along. Some of those MODs were truly amazing given their compact size — too bad the Genesis sound chip wasn’t as capable! Sega-16: Comix Zone is a fan favorite, and it’s been refreshing to see it included on several Sega compilations released lately. Did the game always start out with the comic format, or was this something that came up during development? Peter Morawiec: It was always intended that way — the theme was the primary hook. Many of my STI coworkers were ardent comics fans and I would often tag along with them to local Bay Area comic book shops. I felt that comics and games could be very complementary and worked up a demo animation on my Amiga, which I played for Roger and other execs during one of those greenlight presentations. Both Roger and Tom Kalinske (SoA President) really liked it, so it was a fairly easy sell. (Regarding the demo video) The interesting thing about this animation is that it was created prior to Sonic Spinball — it was one of my first Amiga demos of this sort. When Spinball became a priority, the Comix Zone concept was put “on hold,” which in the games biz often means “cancelled;” however, after Spinball was finished, STI demoed a number of concepts to management, including Comix Zone again. Tom Kalinske remembered it from an earlier presentation and pretty much requested that STI move forward with it — it was as strong of a “green light” as a designer could hope for! We were supposed to have a different CD bundled in – original Comix Zone music re-recorded by a real grunge band Howard (Drossin) put together in L.A., with vocals and all, but marketing decided to do their own thing at the last minute. We were all pretty bummed about it, Howard in particular. The original CD was still actually made in a limited run and distributed with some magazine as a promo, if I remember properly. Sega-16: Roger Hector mentioned that a sequel to was planned, but the team “broke away from Sega.” Was he referring to the STI’s split so that part of the group could work on the Saturn? Peter Morawiec: Probably. Comix Zone hadn’t performed as well as we all hoped (the PS1 stole our thunder) and Sega was focused on launching the Saturn. Adrian, Howard (the composer), and I decided to move to LA and develop games for Sega as an independent studio; however, Roger and Shinobu (SoA VP) convinced us to stay with Sega and helped us establish a satellite STI office in Burbank, where we were tasked with producing a Sonic game for the Saturn (not to be confused with Sonic Xtreme). We created some interesting technology and designs, but ultimately Naka didn’t approve, so that was it. 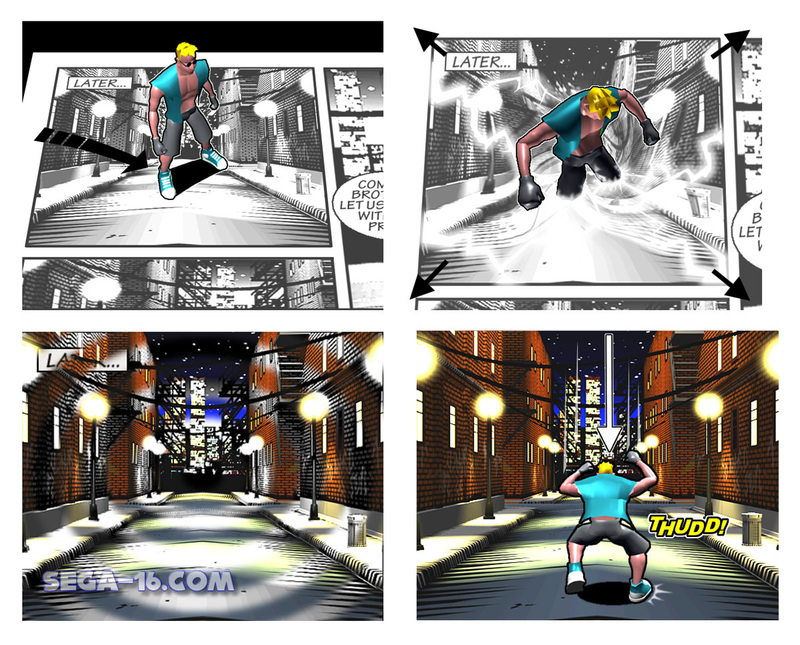 During that time I also created some concepts for a 3D-based Comix Zone, but nothing ever came of it. Sega-16: Sega’s brought back Ecco, moved Sonic into the third dimension, and is revisiting Golden Axe this year. Do you think a sequel to Comix Zone would work in 3D? Many thanks to Mr. Morawiec for taking the time to chat with us! As a special treat for STI fans, Mr. Morawiec has graciously provided us with these exclusive demos for the unreleased Sonic game and Comix Zone. Head over to our YouTube channel and enjoy!